Since Alan Moore & Kevin O’Neill’s League of Extraordinary Gentlemen came on the scene a decade or so ago, there’s been a steady stream of victorian and early-20th-century comic books plumbing the depths of public-domain characters from that era. While LoEG has gotten byzantine to the point of being tiresome (the series’ “easter eggs” have overwhelmed what little story remains, as Chris Sims’ review of the second volume of Century describes), other stories have been worth the effort. 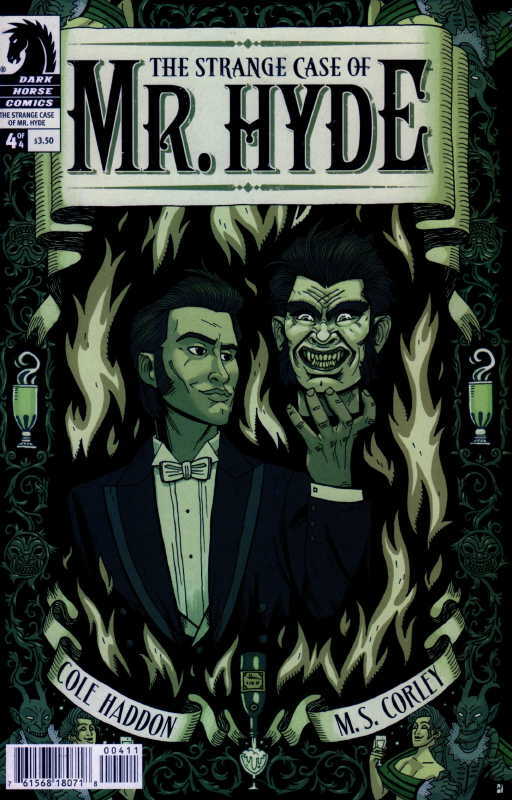 I’ve particular enjoyed this little Dark Horse mini-series, The Strange Case of Mr. Hyde. On the face of it, it’s not a terribly clever premise: There are so many real and fictional characters lurking around late 19th century Europe that we’ll probably see every possible combination of them eventually. This one is Jeckyll-and-Hyde and Jack the Ripper, but it’s done well. Inspector Thomas Adye (a fictional character, as far as I can tell) is assigned to the Ripper case, but he enlists the help of Dr. Henry Jeckyll to help profile the killer. The problem is that Jeckyll is himself stashed away in a dank prison, after his exploits as the dangerous Edward Hyde some years earlier. Jeckyll’s descent into depravity is shown in little pieces and in flashback, just enough to show how he was once a good man but is now a calculating lunatic. He’s a much stronger figure than the character in LoEG. Adye is also a strong character, but a bit naive and credulous, just enough so to be taken in by Jeckyll’s tantalizing promises, but also mistrustful of his superiors and feeling he needs Jeckyll to crack the case. And crack the case the pair ultimately does, but with some consequences for each of them. Corley’s art complements Haddon’s story quite well. He has a clean style, a bit stiff at times, but a good portrayal of the period elements. I occasionally had trouble telling Jeckyll and Adye apart, as the two are each clean-shaven, brown-haired men, but that aside Corley has quite a range of facial expressions. Hopefully this is only the beginning for him. Naturally, there’s a collection coming out. Check it out if you can’t find the individual issues.